When I talk about great online dating sites, I mean sites that have a lot of members, a clean interface, and a decent male to female ratio to make it worth your time to sign up. With all of the sites I will discuss below, your best chance for success with online dating will be in the major cities that I mentioned in the first paragraph of this article. These cities have a larger pool of available singles from which to choose. Don’t worry if you are not in the major cities though. You will just have to send out more messages (i.e. plant more seeds). There are beautiful women in the Down Under for sure. I mean, thank your lucky starts that you are not in countries such as Bolivia or Peru where finding a stunning hot woman is like trying to find a needle in a haystack. The country has its fair share of hot men and women. If you work hard enough at this online dating game, you might even come across a few stunners. Without further ado, here is the quick list of the top 5 dating sites in Australia. I’ll go into more detail in my reviews below. I really can’t say enough good things about the Cupid Media brand (owners of AussieCupid.com.au). I found my wife on AussieCupid.com.au’s sister site BrazilCupid.com. To get straight to the point, if I had to sign up for only two sites, it would be this one and RSVP.com.au (which I will go into greater detail below). This site isn’t as big as RSVP, but I prefer the pricing, which is subscription vs. RSVP’s “stamp” system. Like all of the sites on the Cupid Media network, AussieCupid has a well-designed, easy-to-use website, with pretty basic free profiles, but a bunch of solid features for those who have an upgraded subscription. Signing up takes about two minutes, it’s also free. To start, either join with your Facebook account or your email address. The final step is to tell a little about yourself and define your ideal partner, and that’s it. At this point, you can either finish filling out the rest of your profile, or you can skip it for now and start browsing through pages of profiles. If you do choose to leave your profile incomplete for now, the site will sporadically ask you to fill out a few more questions to continue. Craft a detailed search of your own. AussieCupid will recommend matches to you that fit your previously selected criteria. Searches are a separate matter, with a multitude of options available to you for narrowing down your search. AussieCupid’s messaging features for Standard members are simple to use but not very effective for making connections with people. Things like “Add as a Favorite” and “Show Interest” are good first steps for inviting people to check out your profile, but your best bet is to upgrade to a premium membership, either Gold or Platinum. Once you do so, you’ll be able to start Instant Messaging, audio and even video chats with any member, whether paying or non-paying. By far my favorite feature on AussieCupid is the audio/video chat. I’ve found both of these tools, and video chat in particular, to be essential tools for vetting potential matches for compatibility. It can be hard to get a feel for someone’s personality when chatting via text, but with audio and video, it’s quickly obvious whether or not you’ll get along with someone. Video/audio chats can save you from the mistake of meeting up with someone you won’t actually get along with. The fact that these features are available through the site itself is even better, as there is no hesitancy to give a stranger your phone number or Skype information. Founded on Valentines Day 1997, RSVP is the other site that I would definitely sign up for whether you are an expat in Australia or a local looking for love. It is user friendly and has really improved since I first entered the site way back in 2013. RSVP is the giant of online dating in Australia. It has lots of members (2 million+), and the rate of response is surprisingly high for such a large site with so many members. After entering your basic info, RSVP asks you to upload a photo, and then asks a few questions about yourself and your ideal partner. After these questions, you can continue filling out your profile, or start browsing for matches. Your profile consists of a headline (a personal tagline of sorts), your personal information, physical traits, career and education, and lifestyle, and whether or not you have children or pets. You can also enter your favorite music, books, etc. and join some RSVP groups. Finding compatible matches through the basic search feature is made easy with a ton of different refinement options. RSVP also picks matches for you based on 2-way compatibility between selected ideal match criteria. Why Not Consider – Profiles that may not fit within your specified criteria of an ideal match, but are looking for people like you! RSVP thinks these profiles are worth checking out, and I must say, I agree. Top 100 – Here you can check out the 100 most popular users on RSVP by age category. Although I enjoyed looking through these profiles, I imagine any women in the top 100 get even more messages than normal, which sure didn’t help my chances at all. Free members can send “kisses”, but to actually message anyone, you’ll have to either upgrade to premium or buy “stamps”, which give you unlimited contact with a member for 30 days. This was a unique system for sure, but to me it felt cheap and unnecessarily limiting. They advertise as an upside the fact that you get your stamp back if your message isn’t read, but this is only if your stamp isn’t read in 30 days. Some may like this feature, but I personally prefer paying a flat rate to message as many people as I like. I wish they would get rid of the whole stamp pricing thing. It gets expensive fast. If you are like me who does the “cast the net wide” approach but loves being on a budget, you will see that your wallet will be drained quicker than you can imagine. I am a much bigger fan of subscriptions where I pay a fixed fee and know exactly what I am getting. One feature I did enjoy was the 15-minute personality test. Not only do you receive an in-depth personality report after completion, but RSVP uses your results to find even more compatible matches for you. RSVP also provides a regularly-updated blog, where relationship expert John Aiken lays down some high-quality relationship advice. After soaking up the wisdom here, you can head to one of the live singles events organized by the site, or join discussions online about traveling, hobbies, dating and relationships and more. As much as I like RSVP, I wish the site would take a page out of eharmony’s playbook and have a more thorough questionnaire to weed out some of the timewasters on the site. In many ways, RSVP is just like the real world. There will be men or women who you will not click with or who don’t respond to your messages (or just disappear). There are women or men who might only be interested in helping you to part with your money. That is life. My Advice: Just keep sending out messages and reach out until you find the person you are looking for and get success. As is typical with online dating, expect a response rate of around 1-10% depending on how good your profile is. (response rate = people who will respond back to you to whom you sent an introduction message). OasisActive.com (i.e. Oasis) is a third option you can try if you are considering online dating in Australia. Oasis is only a site I would try if the fish aren’t biting on any of the sites above. The site is massive and completely free (you get what you pay for of course). This site was launched in 2008, quickly becoming one of Australia’s biggest dating sites. In 2014, Oasis merged with another Australian online dating giant, RSVP.com (which I mentioned above), in an effort to reach more members globally. Today, Oasis has around 17 million members in its network, around 70% of these being Australian, with growing member bases in Colombia, Chile and Mexico. At the time of writing this review, when I was on Oasis, over 450,000 members had used the site in the last 24 hours. Oasis’s main strengths are its huge pool of members and the fact that it is completely free to use. Besides these strengths, Oasis is a functional but pretty basic dating site. To sign up, link your Facebook account or enter your gender/gender of interest, username/password, email, birthday and location. You are now a member of Oasis. Your profile is easy to fill out, consisting almost entirely of drop-down boxes and check-boxes. There is also a section to describe your ideal match, with your own words, and selected gender, age-range, and location. You have the option to automatically filter out all messages from profiles that don’t meet your selected criteria. You can also select a background for your profile, with different photos and colors to choose from, upload a profile photo and a private gallery of up to 20 photos that will only be shown to people you choose. Searches can be as broad or detailed as you like, with many different options for filtering your search. These come in the form of check-boxes, organized into various categories: Identity, Appearance, and Lifestyle & Personality. You can also exclude members with whom you’ve had previous contact with, or already blocked or removed from your matches. Oasis will also recommend matches for you, based on your profile and selected filter criteria. Oasis does things a little differently here. As they explain right when you sign up, when someone likes your profile, you are given three days to reply. If/when you reply, you are both added to each other’s Contact list, and can start chatting right away. You can also say “no” straight away, or “maybe” and decide later. If three days pass, the notification is deleted. Chatting with members 1-on-1 is a simple text messaging feature, with emoticons. Two final options are to like someone’s photo, or send a “Shout Out”, a public message to your 1000 most active matches. Shout Outs are free if you share Oasis with your Facebook friends, or $4.95 apiece. Oasis has a few small unique set of features, both for use when viewing profiles. First, you can “like” other members’ photos. This is an easy, indirect way to communicate with someone, and you can also use others’ votes on your own photos to help you decide which one should be the face of your profile. The votes don’t lie! Second, you can take notes on different profiles, for future reference. With approximately 33 million members across the globe, eharmony has established itself as a worldwide leader in the online matchmaking industry. Founded by accomplished author and psychologist Neil Warren, eharmony offers an array of sophisticated matching elements that enable it to stand out from competing sites. While the price of membership is more costly than many competitors, eharmony members benefit from an unprecedented level of web design and features. If you are interested in signing up for eharmony, you should set aside approximately one hour to complete the process. The process begins with your submission of general information, including location, gender, name and preferred match gender. The next phase of the sign up process is the completion of a personality test. This test takes approximately 30-40 minutes to finish and includes questions regarding values sought in a relationship, the frequency of various emotional sentiments experienced within the past month, and the degree of passion or skill that you have for a particular activity. Most questions are answered by using a rating scale that ranges from 1 to 7. After completing the personality test, you will be asked to provide written responses to some open-ended questions related to partner preferences, activities that you are passionate about, and general background details. You are also invited to provide a photo, though this is not mandatory. eharmony has a platform that is similar to other sites that match members based upon the results of personality tests and questions. Accordingly, you are not able to search or browse member profiles. Instead, eharmony will evaluate your test results in conjunction with responses provided by other members to assess the potential for compatibility. Matches are then filtered by location, age, and preferred gender. You will receive the profiles of match candidates but are not able to view their photos during this phase of the process. You can send smiles or engage in basic messaging by text. You can also access eharmony’s Guided Communication protocol, which functions as an ice breaker by providing a systematic set of steps to establish rapport with another member. Premium membership is an upgrade that is available to all eharmony members at additional charge. It includes more advanced communication features such as Secure Call, which allows you to contact other eharmony members by phone without revealing your own telephone numbers. The most distinct feature of eharmony is their Guided Communication system. This system involves four easy steps to help you build a connection with another member. Five Questions: This first step involves two members asking each other 5 questions selected from 55 options provided by eharmony. Members select one of several pre-written answers provided for each question. Questions focus on a variety of topics, ranging from travel philosophy to gender roles. Make or Break Sharing: In this step, members share details on match characteristics that make or break relationships for them. For instance, if you love to laugh, you may cite a sense of humor as a “make” for you. Deeper Probing: In this phase, you ask open-ended questions to another member. You can choose from a collection of questions provided by eharmony or craft your own questions. eharmony Mail: This is the final phase in eharmony’s messaging program. You may opt to skip directly to this step if desired. OKCupid is a popular site worldwide that I’ve used in both South Africa and Brazil. It resulted in almost no results for me. Looking back on my history with this site, I think I’ve only had 1 date max despite hundreds of messages sent. Man is it super frustrating. I wish they would add some more barriers to make it harder for pretenders to be active on the website. OKCupid is really a last resort site if you are in Australia. They have a decent Australian-based user base, the sign up process is easy, and they have a match locator tool. However, the ground is definitely more fertile in the other sites I mentioned above. 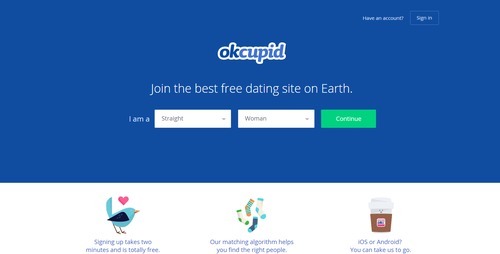 OkCupid.com is free to use. It incorporates several algorithms based on expansive question matching to choose the best matches for those who sign up. The main drawback of this site is that, due to free signup, there are a high number of spammers and fake profiles, making it difficult to find a true and genuine match. Aside from that, OkCupid.com offers you the ability to find your match based on your interest, if you are looking for a serious commitment or a casual hookup. Signing up for OkCupid.com is easy and can be done using your Facebook account or by filling in your details on your own. You will then be asked to choose a username and password. Then, there are questions that ask you about yourself and your personality. Next, you have to Like three profiles so that OkCupid.com gets to know more about you. Then, you are good to go, and OkCupid.com will display the best matches for you. You can just have a basic profile or can also upload your photos. Although there are only eight questions that need to be answered when you sign up, there are other columns that ask you to fill in more about yourself. You can share more about yourself, but make sure that you keep it short so that your profile looks attractive. There are a variety of filters that can be applied on OkCupid.com. When you browse for profiles on OkCupid.com, the display picture, username, location, age and the ‘%Match’ indicator and ‘%Enemy’ indicator will be shown so that you get to know about the compatibility, and this calculation is done based on the questions you answer initially. You can either ‘Like’ or ‘Dismiss’ users while using Quickmatch. However, only mutual likes will be shown as matches. In order to communicate with other users, you can use two options: either by liking or by messaging. Liking is not a preferred option as users will have to purchase the premium membership to know who liked them. If you choose to message, it is free and easy. Alternatively, when you visit a profile on OkCupid.com, the user will get a notification about your profile visit. The complex matching system in OkCupid.com is itself unique, and it matches based on the answers you provide to their set of questions, which include your sexual desires, your opinion on interracial marriages and a few weird questions such as what you think about nuclear wars etc. There are thousands of questions, and the more questions you answer, the more accurate your matches (at least in theory).